a photometry and spectroscopy campaign of four Herbig Ae/Be stars has been launched by the AAVSO. Interesting for Lhires III spectrographs but lower resolution is also welcome. November 21, 2018: Dr. Hans Moritz Guenther (MIT; Kavli Institute for Astrophysics and Space Research) and colleagues have requested AAVSO observers' assistance in monitoring several HerbigAeBe stars in support of upcoming observations scheduled with Chandra. Dr. Guenther writes: "We are going to observe five HerbigAeBe stars (HAeBes). HAeBes are young A or B type stars which are still surrounded by a protoplanetary disk. In that sense, they are similar to their lower mass bretheren, the classical T Tauri Stars. In T Tauri stars, we expect a dynamo similar to our Sun and we do indeed see stellar flares in X-rays which resemble those seen on the Sun or on other active main-sequence stars. In contrast, HAeBes should not have a magnetic dynamo, yet we still see X-rays from many of them. Since we don't understand what's going on, we are going to observe five HAeBe stars with Chandra to test if the strength of the X-ray emission is in some way related to the mass accretion rate. "...It would be very helpful to get an optical lightcurve and the stellar color for a few days before and after Chandra observations to know if anything unusual happens to these stars, e.g. if they have a super-bright flare or if they suddenly become hidden behind a screen of gas and dust as we saw in e.g. AA Tau or RW Aur in the last few years." The targets and their tentative scheduling dates are given below in order of scheduling date. The exact dates/times for the Chandra observation may differ by a up to a few days. The fifth target, V1295 Aql (20 03 02.51 +05 44 16.7, 7.87-7.89 V), will not be observable from the ground during the scheduled Chandra observations on December 5. When they become available, the exact Chandra dates will be given in the AAVSO forum thread for this campaign. One to two BV observations per night are requested, beginning now and continuing for a week after the dates given. Dr. Guenther continues: "I think two bands to get a single color (e.g. B-V) in any system is enough. If any big absorption event e.g. the disk covering the star happens, it will be obvious in any band. It's unlikely (that's presumably why most of these stars don't have regular observations) - but if that happens we would have to know to interpret the Chandra data correctly. "We would also appreciate H alpha spectroscopy...There are two ways to estimate the mass accretion rate: From the width of the line profile and from the total flux in the line. The first requires a resolution on the order 50 km/s (R about 6000), the second works with lower resolution. Lines are typically at least twice the continuum level, so no exceptional S/N is required." Instructions on where to send spectroscopy data will be posted on the forum thread for this campaign. Charts with comparison star sequences for the target stars may be created using the AAVSO Variable Star Plotter (VSP). This AAVSO Alert Notice was compiled by Elizabeth O. Waagen using material provided by Dr. Hans Moritz Guenther. Here are spectra of V1307 Ori and V1410 Ori taken on 21st November and sent to Dr Guenther today. Here are the spectrum of the same stars taken with the DADOS and the 1200 l/mm grating. I'm not sure if they will be useful or not, because the resolution is only medium. 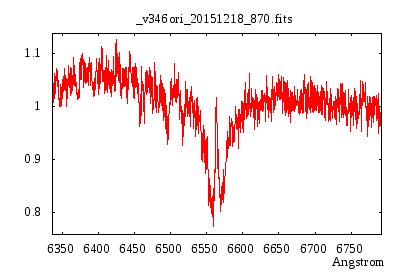 Looking closely at Woody's spectrum of V346 Ori, there is evidence of a small emission feature buried in the H-alpha absorption line, slightly blue-shifted with respect to the absorption line.